I've been lusting after Tarte cosmetics for a while but they are difficult to buy in the UK. In addition, Tarte Cosmetics official website does not ship to the UK (USA, PR and Canada only). The only option appeared to be QVC. QVC don't do samples and had a limited choice of shades (none of the pale shades). 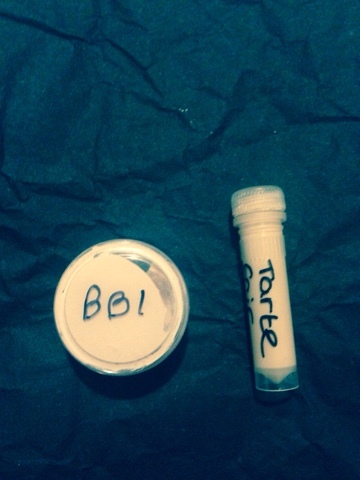 I found a seller on eBay who sold 2ml samples for £3.90. I ordered the shade Fair Sand. I feel its a tad too dark and yellow for me. I planned to order Fair Beige or Ivory come pay day. Whilst waiting, I discovered Rose Beauty Store. This store is online, the office is located in the USA but supply a UK distributor that uses DHL (so you don't pay import fees). They charge £1.49 per sample and £2.00 shipping. One sample would cost £3.49 and two samples would be just £4.98. Www.rosebeautystore.com is worth checking out. Their prices are reasonable and they have an excellent range of some difficult to get products. At the same time as ordering from ebay, I ordered a sample of Jane Iredales Glowtime BB cream in shade Fair BB1 from Skin Maze. This is an award winning salon in Dorset that you can visit for treatments. They stock the full Jane Iredale range and offer a sample service. This sample cost £2.50 and free shipping. 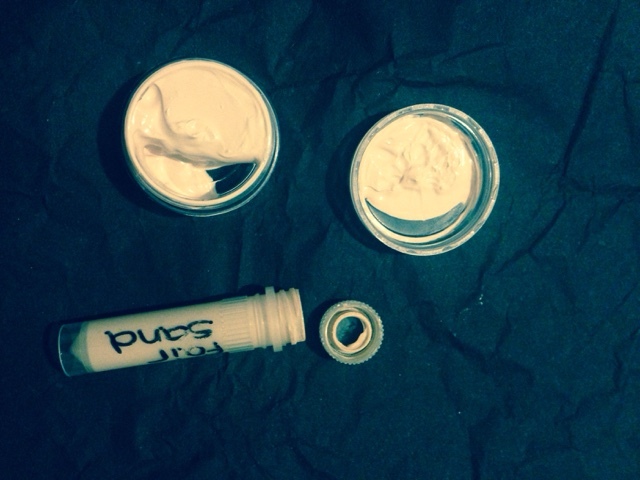 The sample arrived with a generous amount of product. I have used it to do a full face and thought it looked great and felt good on. Sample Jane Iredale Glowtime in Fair BB1 purchaser from Skin Maze. 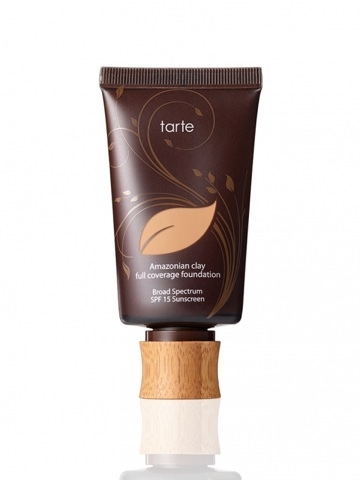 Sample Tarte Foundation in Fair Sand purchaser from eBay but similar can be purchased from Rose Beauty Store for less money. The BB cream feels more moisturising and smooth. Tarte felt thicker and drier but not in a nasty way. Top is Jane Iredale BB cream and bottom is Tarte Foundation. 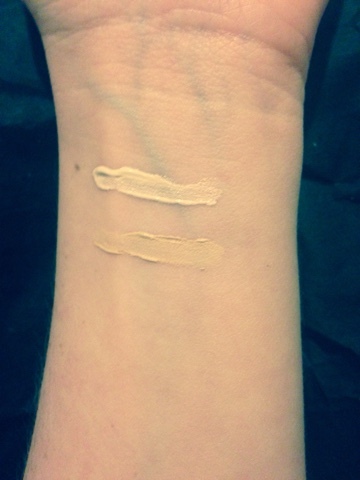 The BB cream is lighter and has a pink tone. 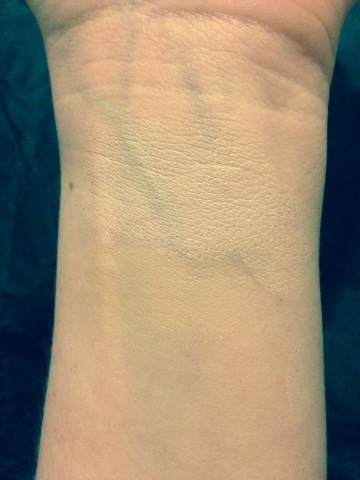 Tarte is darker and has a yellow tone. The both deliver a good full coverage and blend reasonably well. When I applied the BB to my face, I used my blender sponge and it looked smoother. They both seemed to melt into my skin as they warned up. This shade is to yellow for me. I might order Ivory or Fair Beige to see if they are better matches as I love the fact this is made from clay from the Amazon rain forest that has been untouched by pollution. Doesn't that sound beautiful? I do like how the product feels on my skin. The product has an spf 15. I honestly thought this would be too dark - like nearly everything that claims to be light. When I first put it on, it was too light. However, give it a few seconds to adjust and it looks perfect. It feels so good on my skin - it gives that feeling that your skin will be better for wearing it which is the result of a good BB cream. It has an SPF 25 which is great protection for skin that easily burns. Seven of the Jane Iredale products have won the Skin Cancer Foundation seal of approval and this is one of those award winners. I've had my eye on their "powder me spf dry sunscreen". If I couldn't find a good foundation with spf I was going to buy the sunscreen as a finishing powder to give me the protection I need. It claims it can also be used as a concealer but I'm not yet convinced - i think if I had a bad blemish, I'd still want the reassurance of a strong concealer. This BB cream is everything I could wish for. I'm not sure I can wait until pay day. This is the winner of everything I've tested and I don't feel the need to test anymore.